In addition to camping facilities, large lodges, and ample swimming, the grounds offered equestrian trails that the cadets used on a regular basis. Riding classes were also offered and numerous students took advantage of the opportunity to become successful horseman. In conjunction with the school’s R.O.T.C. program, much of this was done to prepare students to use the horse in armed conflict, something that seems obsolete when compared to the mechanized state of warfare at the time. Camp Lupton would continue to serve as Massanutten Academy’s outdoor facility until late in the 20th century when the camp was closed. In 2013 it was donated to the Commonwealth of Virginia and is slated to become a state park. 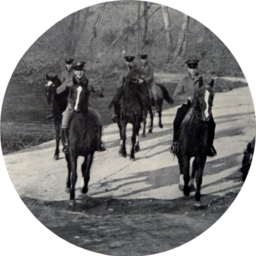 Massanutten Academy, “A riding class on a jaunt through the woods,” Shenandoah County Library Archives, accessed April 25, 2019, http://archives.countylib.org/items/show/5935.